The race to market | What Car? 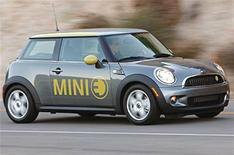 Mini and Smart are already conducting widespread trials with all-electric cars. Mitsubishi and Nissan are in a race to be the first to market with one. Renault and Volkswagen have both said they intend to be world leaders. General Motors, on both sides of the Atlantic, is touting the cause of the 'intelligent' electric car, which has a small fossil fuel engine on board to act as a generator, thus extending the normally limited range once the power stored in the batteries has been exhausted.